Like the animal itself, Chameleon premium WordPress theme adapts to practically any environment because of its ability to change the color of its skin. Chameleon’s pattern and color combinations are nearly endless, providing users with a professional theme and superior customization options that don’t require you to be a web expert. 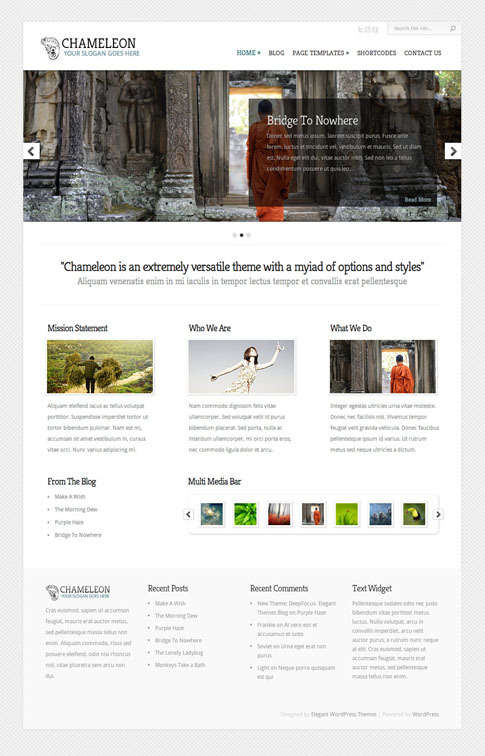 So whether you’re running a personal blog out of the house, or spearheading a worldwide enterprise, Chameleon premium theme is the right tool for the job. Chameleon comes with various font options, allowing you to adjust the header and body text independently. Choose between 3 different homepage slider styles and easily switch between each via the ePanel theme options. Chameleon theme has been localized for easy translation. Using the theme’s MO and PO files, you can quickly translate the design without having to hunt through the theme’s PHP files to change each word, (if you’ve spent any time doing this with your own WordPress themes already, you will realize how invaluable this feature really is). Chameleon utilizes timthumb to automatically resize your thumbnail images. Because of this, only one thumbnail image is required per post despite the various thumbnail sizes used in the theme. With Chameleon, you can place 125×125 banner images in your sidebar and 468×60 ads to your post pages with ease. Advertisements are handled from within wp-admin and can be turned on and off at any time. Come back and check out the showcase as we find more sites from around the web using Chameleon.